Kevin Feely bagged the only goal of the game for the hosts. KILDARE GOT THEIR Division 2 campaign back on track with an impressive victory over Clare this afternoon. Kildare led for the entirety of the game with a powerful final quarter setting them up for the victory. Kevin Feely netted an opening half penalty and with Neil Flynn and Jimmy Hyland proving lethal in the forward line they powered to an eight point interval lead even though Eoin Cleary kicked three points for Clare. Despite Hyland kicking the opening score of the second half it was Clare who controlled the opening few minutes of it with Jamie Malone in particular proving a thorn in the Lillywhite side as he kicked five points in helping them get back to within a kick of the ball. Clare saw a couple of goal chances go by the wayside however and Kildare took full advantage with a series of scores from Hyland, Flynn, Ben McCormack and Adam Tyrrell helping them push clear. 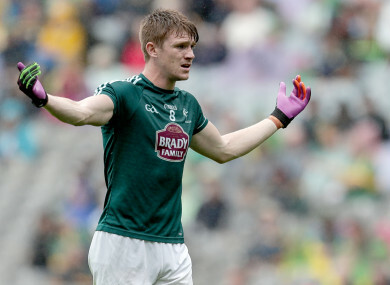 A bad day was made worse in stoppage time for Clare as Cormac Murray saw red for a foul on Kildare captain Eoin Doyle and they must dust themselves down for a relegation fight over the next few weeks. After Kildare had fallen to Fermanagh and Clare got the better of Cork in Round 3 the teams were deadlocked on points so the outcome was always going to shape the rest of the League and it was the home side who left the happier. The win moves Kildare up to third in the League and with a game against local rivals and table toppers Meath next weekend they still have a lot to play for. Scorers for Kildare: Neil Flynn 0-5 (0-3fs, 0-1 mark), Kevin Feely 1-1 Ben McCormack and Jimmy Hyland 0-3 each, Tommy Moolick 0-2, David Hyland 0-1 and Adam Tyrrell 0-1 (0-1f). Scorers for Clare: Eoin Cleary 0-6 (0-2fs), Jamie Malone 0-5, Keelan Sexton 0-1 (0-1f) and Cathal O’Connor 0-1. Email “Kildare get Division 2 campaign back on track with impressive defeat of Clare”. Feedback on “Kildare get Division 2 campaign back on track with impressive defeat of Clare”.